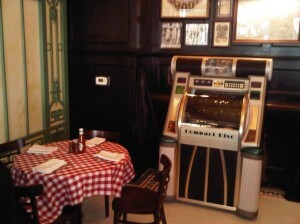 In order to add to the nostalgic atmosphere of PJ Clarke’s restaurant in Downtown Washington DC, the owner requested a Jukebox be incorporated into the background music system. This Jukebox however needed to have the ability to over-ride any other music source that was playing in both the upstairs and downstairs areas. With the way the current sound system was setup, this presented a unique challenge to Metro AV. The existing setup consisted of a Crestron touch panel controlled system that had options for sending different music sources (i.e. IPOD, Internet Radio, etc…) throughout multiple zones in the building. The key here was to make sure that when the Jukebox was started it would automatically shut-off those other sources and then play in all the zones. To do this, Metro AV used an Radio Design Labs audio-sensing relay that tied into the Crestron processor. When the music from Jukebox began, it would switch on the relay and set the processor to output the music to all six zones. When the music stopped, the system would revert back to the originally selected sources. Working in a busy restaurant also presented certain challenges. New wires had to be run from the Jukebox location upstairs down to the equipment rack in the basement. In order to accomplish this without disturbing restaurant patrons, Metro AV came in at midnight on a Sunday and worked through the night. In this aspect, Metro AV is willing to be very flexible when it comes to considering our client’s schedules and needs.